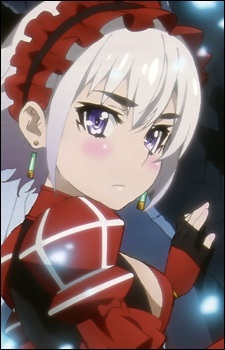 Looks identical to "White Chaika", except her hair is in a shorter bowl cut, and she wears a different outfit which is red rather than white. Like White Chaika, her speech is distorted grammatically, and she also carries a giant coffin which has rollers and rope to pull along. She is essentially the opposite of White Chaika in terms of personality; stubborn, aggressive, and loud-mouthed. She carries a longsword with a snake blade as her weapon.